One day in 1986, Geoff Edgers, a kid from Brookline, heard Run-DMC’s cover of Aerosmith’s “Walk This Way’’ on Boston rock radio station WBCN. It was a pivotal moment, for music and for culture. Edgers, who now works for The Washington Post, will talk about his new book at his alma mater, Tufts University, on Wednesday. 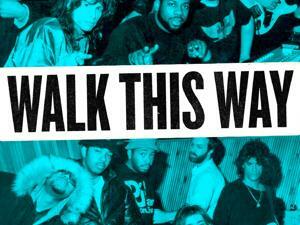 The book’s thesis, in a nutshell, is that “Walk This Way’’ bridged the gap between rock and rap, and between cultures, helping rap to enter mainstream rock culture, finally landing on commercial radio and MTV. Edgers spoke to more than 75 people for the book, including every member of Aerosmith, Joseph Simmons (a.k.a. Run), Darryl McDaniels (DMC), producer Rick Rubin, and former Aerosmith manager Tim Collins. “I hope the nitty gritty of that moment, the time from 1979 to 1986, when Aerosmith was struggling and trying to regain their footing, will be exciting for Boston folks, and everyone, to read,’’ said Edgers, who’ll be speaking at Varis Lecture Hall, Granoff Music Center, at noon. Edgers delves into great detail about what led the rappers into the studio with the rockers and “what actually went down’’ on March 9, 1986, the day of the recording.